Even those not living in the zombie apocalypse world know the name - and he's left quite an impact on Walking Dead fans everywhere! We're paying tribute to the king of evil with his very own soap! Get to know Negan by some of his favorite and most memorable quotes - and now you can take advantage of our overstock from Walker Stalker Con with a reduced price AND it’s ready to ship in time for the holidays! Our rectangular vegan soap starts with layers of color - colors will vary. The image and caption are printed on water soluble paper and will wash away along with the soap as its used. 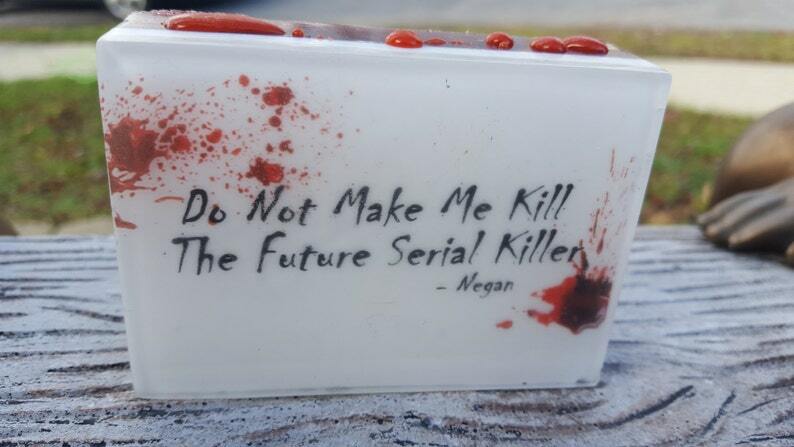 A fun gift idea and party favor for the Negan fan - and as evil as he is, let's face it - all fans (myself included!) still love him. Each bar, weighing just under 6 ounces, will slightly vary based on the colors used. Sayings vary from “You’ve got beach ball sized lady nuts” to “Easy Peasy Lemon Squeezy”. Over 6 phrases available. Scented with a subtle yet fresh Vanilla Cream oil. With this particular sale, you’ll receive 1 bar with a random saying. Each bar is packaged with a little wooden Lucille all of its own. Great gift and stocking stuffer! We always combine shipping on multiple purchases. Overages will be refunded once your items are ready to ship. Please Note: This soap is our unique creation inspired by the book and television show and is not affiliated or endorsed by the author, publisher or other related entity. It is not a licensed or trademarked product by the author, publisher or other related entity. The book appearing in any photo is for photographic purposes only. The Walking Dead (TM) and all references are licensed trademarks of Robert Kirkman LLC and AMC.